Preschool Math activities are so important for successful first years in school. Preschool Math can be so much fun! This summer I've decided to concentrate on Math activities more. We love outdoors and spend lots of hours exploring and playing outside. So our Math will last for 3 min a day with the extended free play if wanted. What can be accomplished with only 3 minutes of Math a day? It is not about numbers and counting! The fun important things to consider are classification, analogies, vocabulary development, patters, comparison, inference, sequencing... These requires some intense brain work and concentration; and preschoolers can do only so much of that. Through our work so far I had to constantly remind myself that what seems like an easy activity for adults - is a real challenge for little ones. Manipulating with the pattern blocks benefit them on so many levels: beginning critical thinking, fine motor skills, memory, visual discrimination, applying the knowledge of basic shapes to the real life tasks. 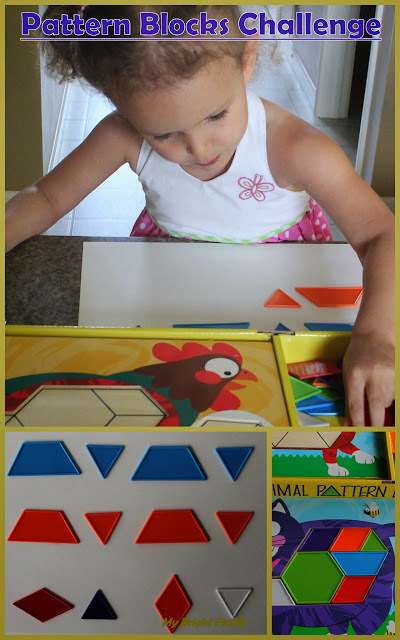 We were lucky to find Animal Pattern Blocks by Melissa & Doug. My Firefly loved the set for toddlers, and was very happy to see this set for ages 3 and up. Amazon affiliate link: Melissa & Doug Animal Pattern Blocks Set . The colored shapes can provide hours of fun with puzzles and games. We can easily just through them into the busy bag for travelling! The first day: first we had some free play and exploration of the blocks. She completed all the animals included with correct shapes and any colors - not much of a challenge here. There are only 4 shapes in this set. She easily learned the name of the new one for her: trapezoid. Yes, I spent my 3 min saying "trapezoid" and asking her to repeat the word. Well, I find 3 minutes while I start on dinner, and she is at the counter busy playing with her game of the day. The second day: a real challenge! She had to fill the blue dinosaur with the blue shapes only. It might be easy to sort by shapes only, or sort by colors only. It requires much higher level of critical thinking and problem solving to find and describe an object using two words: "blue triangle". So our 3 min that day were spent for encouraging her to find a part of the given shape and color. Then she found a shortcut all by herself: she was picking all the parts of the same color first and after that working on finding the shape she needed. The third day: some creativity with patterns. The first row is easy. My Firefly created a pattern with the given shapes. The task for the next row: create the same pattern, but use orange shapes only. The first two shapes were very difficult and placed with lots of assistance. She found the last two shapes, but the color was wrong (pictured above). The last row: create the same pattern, but use diamonds instead of trapezoids. Activities with pattern blocks (or colored shapes) are the best for developing critical thinking by matching, sorting, patterns, and so much more. There are lots of ideas for games with shapes included with the Animal pattern blocks.